As far as Marvel is concerned, EVERYTHING is better with a little Wolverine in it. Let's take a trip back to 1995 and put that theory to the test, shall we? The X-Men's Gambit travels to London to investigate the death of an old friend, one in a string of murders of women that seem to mirror those of Jack The Ripper. 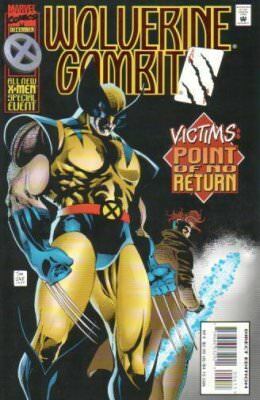 He quickly finds himself hunted by the police and running into fellow X-Man Wolverine. . .who can't explain why he's in London or why he's covered in blood. Not a bad start for this mini. The story hook of Wolverine possibly being a serial killer is a decent one, but it's pretty obvious that's not how this is going to play out. 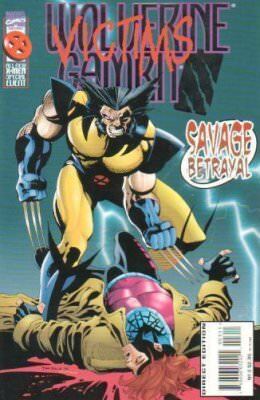 This issue is more of a Gambit comic, with Wolverine showing up only in the final couple pages and being told from Gambit's point of view. I like that the focus was more on Gambit investigating than on superheroics and punching through problems. Tim Sale's art is really good on this issue. I'm a fan of Sale but he can sometimes get a bit over-impressionistic. Except for Gambit's face sometimes looking demonic or like a vampire, there's nothing holding this comic back from being a showcase for his dark and moody style. Overall, a great opening issue that makes me want to get right into the next one. After Wolverine and Gambit escape from an elite anti-terrorist unit with the help of a mysterious and beautiful woman claiming to be working for Interpol and Nick Fury, they find themselves trapped in an underground maze of sewer tunnels. . .
After a great opening issue, things take a turn for the worse with this second part. 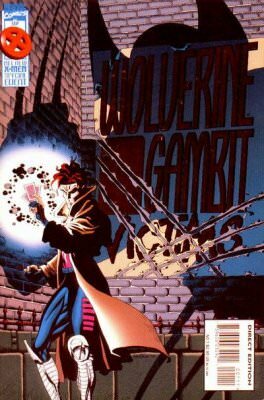 It turns out that Gambit and Wolverine are being played for suckers in some sort of game being played by the villain Arcade and the mysterious woman (who turns out to be the daughter of the villain Mastermind), but the book is completely propped up with a series of coincidences and unexplained situations that lay a convoluted trail to the final villain reveal. The art also takes a bit of a turn as well. . .while still generally good, Sale begins to indulge in some of his particular habits of over-exaggeration, with the features of Gambit becoming more gaunt and demonic and Wolverine becoming more bloated and muscular as the issue goes on. Overall, I wouldn't call this issue BAD. . .I'd just say it's not as good as the first and showing signs of the typically worst parts of Loeb/Sale collaborations. 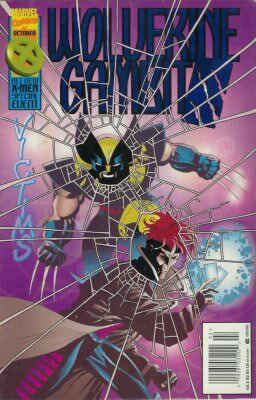 The villains Arcade and the New Mastermind manipulate the thoughts and memories of Wolverine and Gambit, forcing the heroes to fight each other. Not sure what Arcade and Mastermind's end game is, but Mastermind has the ability to manipulate memories, so most of this issue is Gambit flashing back to when he met the detective whose death he was investigating, and Wolverine married to Mariko and living happily in Japan. Gambit manages to fight his way free and somehow is able to enter Wolverine's flashback in order to try and bring him back to the real world. . .all while the villains laugh evilly. Sales art swerves back to very strong here, with Wolverine's scenes in Japan being exceptionally good. . .but the story is a bit weak and riddled with holes. A cliche "heroes fight until they realize they're being used", then escape and villain beat-down for the next issue is obviously projected. All in all, this third issue has some of the best art so far, but that great art is in service to a weak story that pretty much is nothing but setup for the finale. When Mastermind discovers that she is being used by Arcade, the two villains turn on each other, giving Gambit and Wolverine the chance to escape captivity and bring their scheme to an end. The final issue brings it all together in a hot mess of robot punching, deus ex machina, dangling plot threads, and things that have absolutely nothing to do with the previous 3 issues being extremely important to the conclusion. The good news is that while the writing has been on a steady downward curve since the first issue, the art has been on an upward curve, with this issue having probably the best art in the set, especially the final scenes of Wolverine and Gambit in a graveyard discussing what happens next in their lives (SPOILER: They're both going to remain gloomy a$$holes for the time being). Overall, this issue feels disconnected with the other 3. Instead of finishing up THIS story in a satisfactory way, it seems to want to set up future story threads. It wasn't until this issue that I realized the whole mini was ACTUALLY for the introduction of the New Mastermind to the Marvel Universe. And here, I thought it was a Wolverine/Gambit teamup. If I had to describe this mini-series in one word, it would have to be: Misleading. On the surface, it obviously seems to be a Wolverine/Gambit teamup comic, but in reality it's the introduction of a new villain to the Marvel Universe (Mastermind II). Of course, this doesn't become clear until the final issue. By the time you realize the true purpose of the story, it's over with. I'm not sure if that's extremely clever or just plain deceptive. That aside, this mini is pretty forgettable. The story is okay. The art is pretty good. Neither is great in any way. There's nothing standing out as excellent or memorable. This mini is like a popcorn action movie that you forget the plot to immediately after leaving the theater. It's not BAD, but it's not good either. It's just sort of. . .there. I found these comics in the dollar box. That's right where they belong. How about some more 90's -Tastic Wolverine Team Up Action? Iron Fist/Wolverine, then more Punisher/Wolverine, then some Elektra/Wolverine and THEN Nightman/Wolverine! Just kidding. No more Wolverine teamups for now. HEY! Anybody remember the time that Jonah Hex travelled to the future for some apocalyptic mayhem? DC's HEX. . .all 18 goddamn issues.